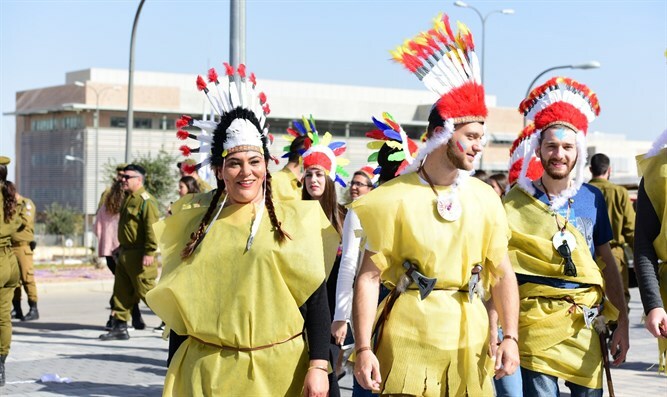 Thousands of IDF soldiers celebrated the Purim holiday at the Ir HaBahadim complex near Yeruham on Thursday. The base is a collection of different training complexes from the various IDF units, including the Manpower and Medical Corps. The festivities included a concert, food, and a costume contest in which the soldiers from different units competed against one another. During the costume contest, each unit took upon themselves to represent a certain theme. For example, the soldiers from the Military Police Corps training base won the first prize after dressing up as prisoners, while soldiers of the Logistics Corps dressed up in their unit's colors. The IDF has historically always marked the traditional Jewish holiday of Purim, though this event was the largest celebration the IDF has thrown to date. "We need to carry out activities that include all the different bases in order to build pride in serving in the IDF," said Yotam Regev, who heads Ir Habadim's education section.